Bhutto is the story of the first woman in history to lead a Muslim nation—Pakistan. Newsweek called it the most dangerous place in the world, and the home of nuclear warheads and the Taliban. Benazir Bhutto was educated at Harvard and Oxford Universities, and with an eye on a foreign-service career, Benazir's life changed forever when her father, Pakistan's first democratically elected president, chose Benazir to carry his political mantle over the family's eldest son. Her two terms in power saw acts of courage and controversy as she eradicated polio and stood up for women, fought the male-dominated political elite and a nervous military leadership, and battled accusations of corruption and scandal. With her assassination she transcended politics, but left a legacy of both simmering controversy and undeniable courage. Duane Baughman is the owner and founder of the San Francisco-based Yellow Pad Productions, through which he spent nearly three years directing, producing and funding the 2010 Sundance Film Festival documentary Bhutto. He is the owner of the nationally regarded political direct-mail firm The Baughman Company, which has been responsible for helping elect Michael R. Bloomberg mayor of New York City as well as another barrier-breaking woman, Hillary Clinton. Johnny O'Hara is a writer and director and the winner of the Sundance 2008 Audience Award for Best Documentary for Fuel, which went on to become one of fifteen documentaries short-listed for the 2009 Academy Awards. O'Hara's first book, published by Penguin, is titled Elvis & You. Arleen Sorkin is an award-winning actress, writer and producer. Arleen was the host of America's Funniest People. She co-wrote the humor books From Here to Maternity and My Bad: The Apology Anthology. Arleen co-created and co-executive produced the sitcom Fired Up. She also co-wrote the movie Picture Perfect and co-produced the award-winning RFK, an Off Broadway play. Pakistan expert Mark Siegel, a partner at Locke Lord Strategies, served as deputy assistant to President Jimmy Carter. He was the assistant to former Senator and Vice President Hubert H. Humphrey and executive director of the Democratic National Committee. 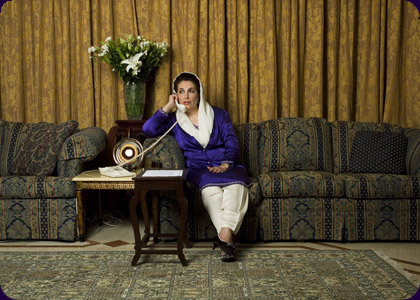 Mark assisted Benazir Bhutto in updating her autobiography Daughter of Destiny, and co-authored with her Reconciliation: Islam, Democracy and the West shortly before her death.